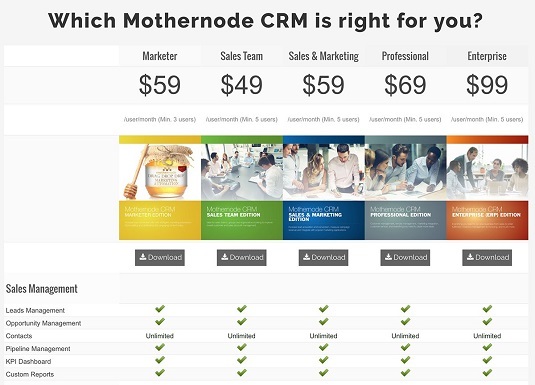 Just like all CRM companies are different in the software they offer, all of them also have different pricing models. You want to look at all the costs involved with getting your CRM up and running. This concept is called total cost of ownership (TCO). Per-user: Some CRM platforms charge per user. You want to be absolutely sure to have one login per user for accountability reasons. If you need a lot of users, make sure you factor in those costs, as well as future costs as your company grows. A CRM with per-user pricing. Per-contact: CRM platforms that include marketing tools sometimes charge per contact. This pricing structure may end up being more affordable, depending on the number of people in your company using the CRM. Be sure to find out whether there are costs or limitations for sending email, tracking websites, or other functions. 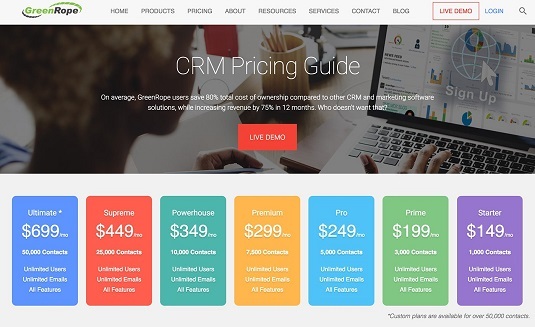 A CRM with per-contact pricing. Setup: Some CRM companies charge an initial upfront cost associated with creating your account. Sometimes this setup cost is to make you feel vested in buying the software so you don’t leave. Most companies with setup costs include training and/or strategic consulting, so you’re getting value from the beginning. Integration: If you’re buying a CRM that doesn’t include everything you need, you also need to buy third-party software and connect it to your CRM. That software likely also has subscription costs, and you also have to pay for integration. Automated integration, such as with third-party software providers like Zapier, is usually inexpensive, but if you need custom integration, it can be costly. Training: Every CRM requires some training to understand how to best use it. Look at hourly rates and find out how many hours it should take to onboard your team. Support: If you or your team have questions, it should be easy to get help. If you have to pay extra for email, phone, or live chat access to support, make sure you factor that in. Creative: If you need creative work done, such as designing an email template, building a landing page, or posting a lead capture form, there should be a given hourly rate, along with estimates for doing each. Usage: Most CRM platforms charge on a sliding scale with your usage of the platform. These costs may be passed on to you as incremental costs for emails sent, website visits tracked, transactions processed, or text messages sent and received. Access: If you want to use different parts of the CRM and its capabilities, there may be additional costs. Be sure to think through everything you want to use your CRM for and build in access to all the functions you need. Take all these into consideration when you’re looking at costs for your new CRM. If you’re presented with an overly complicated cost schedule, or one that is ambiguous and undefined, be skeptical.